Just three of us ended up going on this trip: Simon Byatt, Jacqui Mudie and myself. 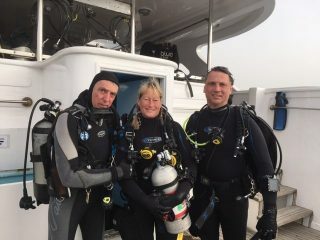 We left Hurghada at 8.00am on the Saturday morning for the shake down dive on the Tobia Arba Reef. Next off to dive the Salem Express, from there we motored north most of the night to get to the Thistlegorm. Up at 6.00 briefing 6.30 on the wreck by 7.00, back on board by 8.00 for breakfast. We sat around getting some sun until our second dive on the same wreck, then back for lunch a bit more sun then evening / night dive on the Thistlegorm. The first dive of the day was the Thistlegorm again then we headed South to the Dunraven then onto the Giannis D before a night dive on Abu Nuhas Reef. First dive of the day the Carnatic, then the Chrisoula K, the barge in the afternoon and again for the night dive. We motored across the shipping straits and moored up over the Rosalie Moller for the night. Up at 6.00, briefing 6.30 and off we go, first dive on the bow up to the funnel. We had to do a bit of deco on our way back but it was worth it. We spent most of the morning sitting in the sun before the second dive which was the stern of the wreck. Last day of diving and we are back just out side of Hurghada on the wreck of the El Manela for our last two dives. Friday a day of sitting around the pool drinking beer before our flight home. A very good Red sea trip and thanks to Jacqui for getting the trip arranged.